Native to Australia, the largest kangaroo is the red kangaroo. 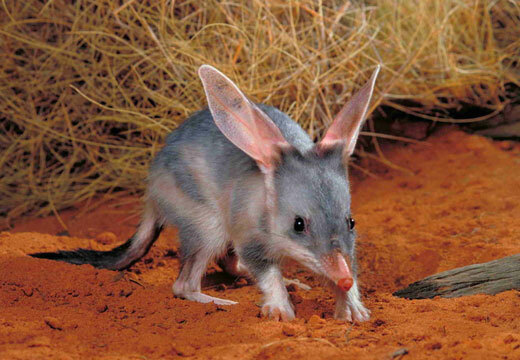 It is also the largest surviving marsupial on earth. It is found all across the mainland of Australia, except for the fertile areas in the south, the east coast, and the rainforests in the north. 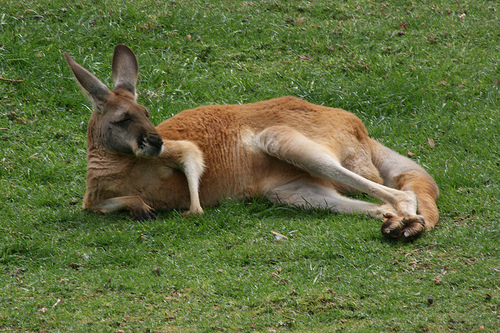 The red kangaroo has short, red-brown fur which fades to a pale colored buff below and on the limbs. It also has long, pointy ears and a squared-off muzzle. Female kangaroos are smaller than male kangaroos, as have a blue-gray-brown fur and are pale gray below. However, female red kangaroos that reside in the arid areas of Australia have the same fur color as male red kangaroos. 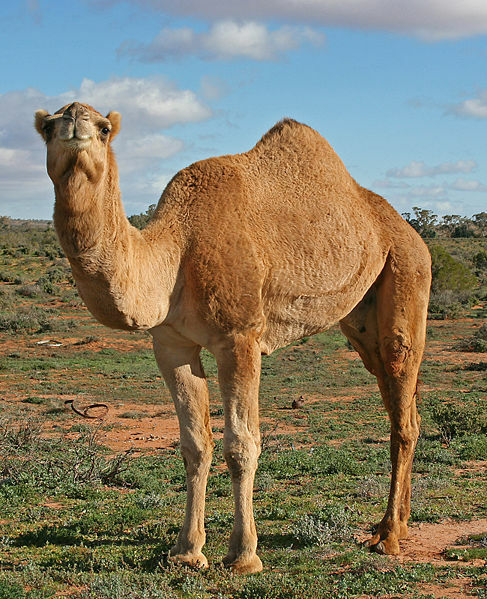 It also has a strong tail which is used as a tripod along with its legs to stand upright. Its two muscular hind legs are used for jumping, and male red kangaroos can jump over 9 meters (30 feet) in just one leap! Male red kangaroos grow up to 1.4 meters (4 ft 7 in) tall and weigh about 85 kilograms (190lb). Females are just slightly shorter at 1.1 meters (3ft 7 in) and can weigh up to 35kg (77lb). Their tails are about 1 meter long (3.3ft). The red kangaroo is found throughout central Australia. It lives in all sorts of habitats, including scrub land, grass land, and the desert. However, they prefer open grass land and avoid areas with lots of trees and shade. They prefer to eat grass, but they also eat a lot of shrubs. It can live without a water hole for a long period of time, as long as it has acess to green plants as they have an ability to take out a plants moisture. The Red Kangaroo lives along, or in a small group called a mob. A mob is made up of 2 to 10 kangaroos. They sometimes gather in large numbers if they are in an area where they can forage a lot. Sometimes this group is as large as 1500! They are usually nocturnal as they like to rest in the shade during the day, although they have been found to move during the day time. As the red kangaroo is large, it usually does not have a non-human predator as they can defend themselves with their legs and clawed feet. 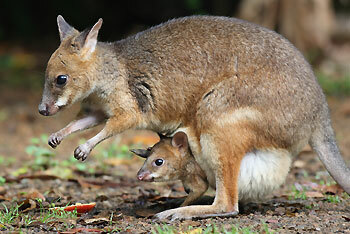 However, eagles and dingoes will kill and eat joeys and therefore joeys are protected in their mothers pouch. The red kangaroo did use to have major predators, however they are all now extinct. This included the thylacine, marsupial lion, megalania, and the wonambi. Although the red kangaroo is abundant, it is protected in many of Australia’s national parks. 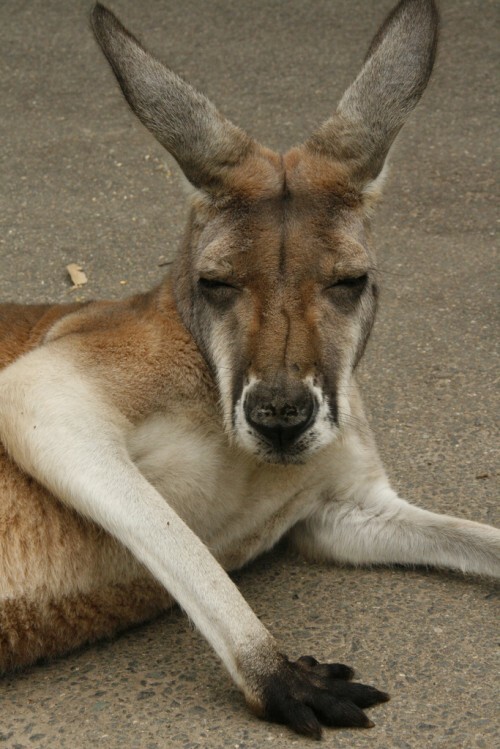 However, as they are so many kangaroos, they are regulated and shot by farmers as they can kill livestock and rabbits. As a result, hunting permits are issued and commercial harvesting is allowed under nationally approved plans which aim to maintain the population of the red kangaroo and manage them as a renewable resource as it is now sold as meat to the pet industry and as kangaroo steaks for human consumption. Their fur is also used as leather, and almost all professional soccer players wear boots made from kangaroo leather as it is the lightest and strongest type of leather.